1 Deep 17.50mm Medium thin Extra-large cup for players with a thin robust embouchure. Produces a great volume of tone. 1X Deep 17.00mm Medium wide The pre-1970 (old style) No. 1, wide with a slightly smaller cup and wider rim than the present model. 1B Medium deep 17.00mm Medium wide Large cup for players with a robust embouchure. Produces a warm tone with great volume. 1C Medium 17.00mm Medium wide Large diameter, medium cup – good for all-around use. 1CW Medium 17.00mm Slightly wider, gradually lowered toward the outside. Same as 1C with wider cushion rim. 1D Medium shallow 17.00mm Medium wide Medium shallow cup facilitates high register. Brilliant sound. 1E Shallow 17.00mm Medium wide Facilitates high register. 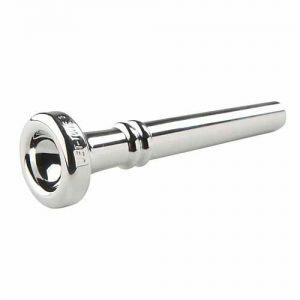 Excellent mouthpiece for soprano or piccolo trumpet. 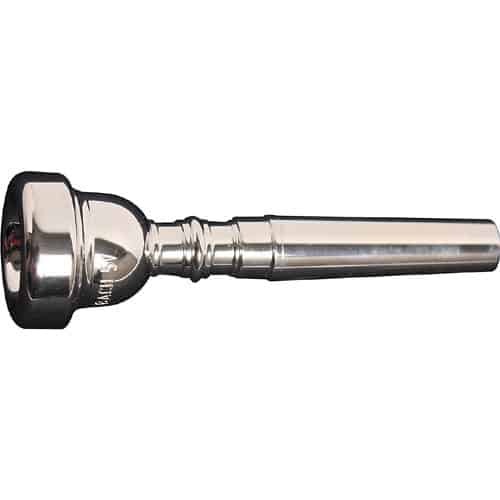 1 1/4C Medium 17.00mm Medium wide Large cup for powerful trumpeters. Compact tone of great carrying power. 1 1/2B Medium deep 17.00mm Medium wide, not too sharp. Produces a scintillating warm tone of large volume. For players with a well-trained embouchure. Comfortable rim contour. 1 1/2C Medium 17.00mm Medium wide, not too sharp. Large diameter, medium cup – good for all-around use. 2 Deep 16.50mm Medium wide, lowered toward the outside. Large cup; powerful Teutonic quality of tone. For players with a good embouchure. 2C Medium 16.50mm Medium wide, lowered toward the outside. Large cup; powerful, brilliant tone. For players with a good embouchure. 2 1/2C Medium 16.40mm Medium wide, lowered toward the outside. Large cup; brilliant, heroic, crisp C trumpet tone. For players with strong, muscular lips. 2 3/4C Medium 16.40mm Medium wide, lowered toward the outside. Slightly narrower than 2 1/2C. Large cup; bright, lively C trumpet tone. For players with a normal embouchure. 3 Deep 16.30mm Medium wide Fairly large cup with full rich tone. 3B Medium deep 16.30mm Medium wide A fairly large cup. The tone is warm and full. 3C Medium 16.30mm Medium wide Fairly large cup, good for all-around use. 3CW Medium 16.30mm Slightly wider, lowered toward the outside. Same as 3C with wider cushion style rim. 3D Medium Shallow 16.30mm Medium wide Fairly large, medium shallow cup produces a more brilliant tone. Facilitates high register. 3E Shallow 16.30mm Medium wide Preferred by players who want a large mouthpiece but with a shallow cup. Facilitates high register. 3F Extra shallow 16.30mm Medium wide Same as No. 3E but with extra-shallow cup. Produces sparkling tone in the extreme high register. 5A Very deep 16.25mm Medium wide, rounded inside edge. A fairly large cup with a dark, full, mellow tone. 5B Medium deep 16.25mm Medium wide, lowered toward the outside. Medium sharp edge. A precise rim and a fairly large cup. The tone is vivid and full. 5V Very deep 16.25mm Same as 5B. V-style cup with larger #20 throat and #25 backbore. Free blowing, very flexible. 5MV Medium deep 16.25mm Same as 5B. Medium deep V style cup with #25 throat and #25 backbore. Good commercial sound. 5SV Shallow 16.25mm Same as 5B. Shallow V style cup with #25 throat and #25 backbore. 5C Medium 16.25mm Medium wide, well rounded toward the inside and outside, fairly flat. For players with a strong embouchure who do not like a sharp edge. The tone is lively and rich. 6B Medium deep 16.20mm Medium wide, not too sharp. Produces a beautiful, ringing tone and responds easily. Medium-large size gives the lips sufficient room to execute freely. 6C Medium 16.20mm Medium wide, not too sharp, rather flat. A distinctive C trumpet cup. Its clear tone cuts through the largest bands and orchestras. 7 Deep 16.20mm Medium wide, lowered toward the outside. Med. sharp inside edge This popular model produces a colorful, liquid tone which is uniform over the entire scale. Desirable for all-around work. 7A Very deep 16.20mm Medium wide, lowered toward the outside. Med. sharp inside edge. Warm, melodious, rich tone approaches the quality of a lyric soprano voice. Free blowing. 7B Medium deep 16.20mm Medium wide, lowered toward the outside. Med. sharp inside edge. Slightly livelier timbre than the #7, full in the low and middle registers, responds easily on high tones. Warm, rich sound. Well suited for all-around use. 7BW Medium deep 16.20mm Slightly wider, lowered toward the outside. Med. sharp inside edge. The same features as No. 7B with a cushion rim for players with slightly heavier lips. 7C Medium 16.20mm Medium wide, lowered toward the outside. Medium sharp inside. Well rounded edge with a perfect grip. Probably the most widely used model in the world. Its brilliant tone is preferred by school musicians and by artists. 7D Medium shallow 16.20mm Medium wide, lowered toward the outside. Similar to No. 7C. A shallower cup than No. 7C, designed principally for D trumpet but used successfully where great brilliance and easy high register are required. 7DW Medium shallow 16.20mm Slightly wider than No. 7D. 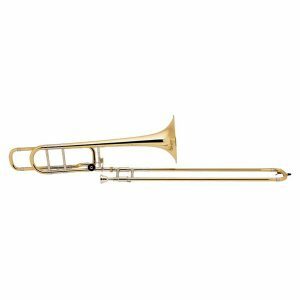 This shallow Eb soprano trumpet (or cornet) cup is excellent for D trumpet and for playing continually in the high register. Cushion rim is helpful to players who use a little too much pressure. 7E Shallow 16.20mm Medium wide. Similar to No. 7C. This extra-shallow Eb soprano trumpet (or cornet) cup produces a crisp, sparkling tone in the extreme high register. Widely used for piccolo trumpet. 7EW Shallow 16.20mm Slightly wider than No. 7E. The same as No. 7E with a cushion rim. For players accustomed to playing with much pressure, especially in the high register. 8 Deep 16.20mm Fairly wide with a slightly flatter surface than No.7. Rounded inner edge. The same cup as No. 7 but with a rim that players with protruding teeth find more comfortable. 8B Medium deep 16.20mm Fairly wide with a slightly flatter surface than No.7B. Rounded inner edge. The same cup as No. 7B, with a rim that players with protruding teeth find more comfortable. Darker sound than No. 8. 8C Medium 16.20mm Fairly wide with a slightly flatter surface than No.7C. Rounded inner edge. The same cup as No. 7C but with a rim that players with protruding teeth find more comfortable. 81/2 Deep 16.10mm Medium wide, lowered toward the outside. Medium-sharp inner edge. Slightly smaller in diameter than No. 7; produces a full, round tone. 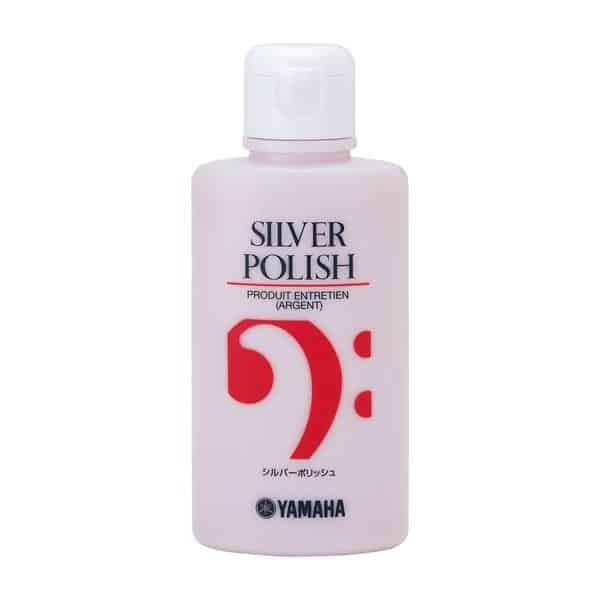 Preferred by players with a sensitive embouchure and by those whose work is very strenuous. 8 1/2A Very deep 16.10mm Medium wide with rounded inner edge. Produces a full, velvety tone. Suitable for cantilena playing. 8 1/2B Medium deep 16.10mm Medium wide, lowered toward the outside. Medium-sharp edge. Like No. 7B but with a cup diameter just enough smaller to facilitate production of the high tones. 8 1/2C Medium 16.10mm Medium wide, well rounded. Medium C cup provides flexibility and easy response. Clear, brilliant tone throughout the register. 8 3/4 Deep 16.10mm Medium wide, not too sharp. Produces a tone of great volume and Teutonic character. Very effective in symphonic work and opera. 8 3/4C Medium 16.10mm Medium wide, slightly flat. Similar to No. 7C, but with a slightly smaller cup diameter. Response helps endurance for players who suffer from fatigue. 9A Very deep 16.05mm Medium wide, well rounded. Produces a mellow, sweet cornet tone. 9B Medium deep 16.05mm Medium wide, lowered toward the outside. Corresponds with No. 9. Slightly darker tone. Players with narrow lips who tire quickly feel relieved when using this model. 9C Medium 16.05mm Medium wide, lowered toward the outside. Similar in size to No. 9 but produces a more brilliant, open tone. 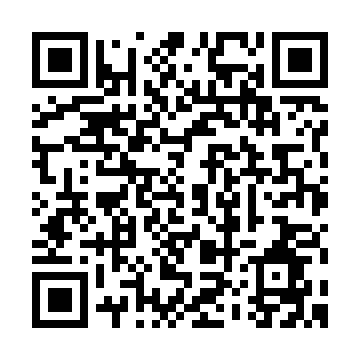 Free high register, easy response. Suitable for strenuous all-around work by players with narrow lips. 9D Medium shallow 16.05mm Medium wide, lowered toward the outside. Similar in size to No. 9 and in tone to the more brilliant No. 7D. Players with narrow, sensitive lips get satisfactory results with this model. Recommended for the extreme high register. 10 Deep 16.00mm Fairly wide with a rather broad, flat surface. Similar to No. 7, but smaller in size and with a broad, flat rim. Suitable for players with fleshy soft lips. 10B Medium deep 16.00mm Fairly wide with a rather broad, flat surface. Same size as No. 10 but with warmer tone. Gives good results to players with heavy, thick-lips, especially those who become easily fatigued. 10C Medium 16.00mm Fairly wide with a rather broad, flat surface. Same rim as No. 10, but with a shallow C cup. Especially designed for high notes and sparkling brilliancy. 10 1/2A Very deep 15.90mm Medium wide, well rounded. Produces the mellow, rich lyric cornet tone favored by players of the Italian school. 10 1/2C Medium 15.90mm Medium wide Fine high register, resonating low register. Particularly useful to players without a strong embouchure. Ideal for C trumpet. 10 1/2CW Medium 15.90mm Extra wide, high toward the inner edge. Size, cup shape, and playing qualities are similar to the 10 1/2C. Cushion rim recommended for players who use heavy pressure. 10 1/2D Medium shallow 15.90mm Medium wide, high toward inner edge. Similar in size to No. 10 1/2C, with a shallower cup for more brilliancy and an easier high register. 10 1/2DW Medium shallow 15.90mm Extra wide, high toward the inner edge. Same depth of cup and diameter as 10 1/2D, with an extra-wide cushion rim for players with fleshy lips. 10 1/2E Shallow 15.90mm Medium wide, high toward inner edge. The same scintillating tone as No. 7E. Preferred by players with weak lips who have to play in the high register. 10 1/2EW Shallow 15.90mm Extra wide, high toward the inner edge. Cup diameter and shape are the same as No. 10 1/2E, but the extra-wide rim offers support to players who have soft, fleshy lips and play continually in the extreme high register. Sometimes used for piccolo trumpet. 10 3/4A Very deep 15.75mm Medium wide, well rounded. Slightly smaller cup diameter than No. 10 1/2A. Has the mellow, sweet tone generally used by players of the Italian school. 10 3/4CW Medium 15.75mm Extra wide Cushion rim for players with thick, fleshy lips who are accustomed to using much pressure. 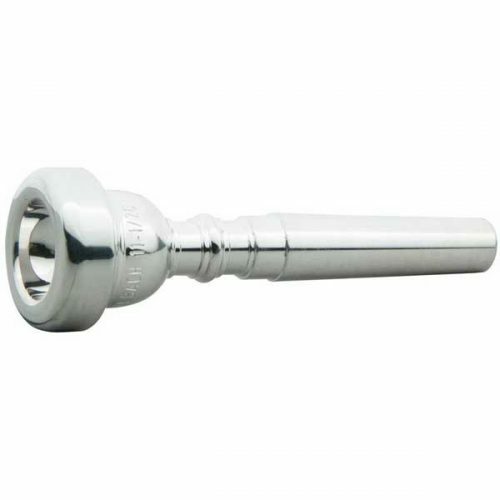 There is no easier blowing mouthpiece with such voluminous and brilliant tone. 10 3/4EW Shallow 15.75mm Extra wide Shallower than No. 10 3/4CW to produce a very penetrating, glittering tone. For extreme high register work. Cushion rim. 11A Very deep 15.70mm Medium wide, well rounded A medium-small mouthpiece with a round, full, old-fashioned cornet tone. 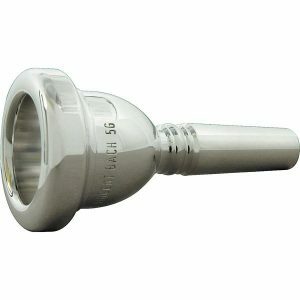 11B Medium deep 15.70mm Medium wide, well-rounded A medium-small mouthpiece with a beautiful, full, clear tone. Responds very easily, especially in the upper register. For players in the upper embouchure. 11C Medium 15.70mm Medium wide A beautiful brilliant C trumpet tone that requires little effort to play in the high register, yet with a free low range. 11D Medium shallow 15.70mm Medium wide, well rounded. Produces a brilliant tone, effective in the high register. Good for players not having a strong embouchure. 11DW Medium shallow 15.70mm Extra wide Players with thick, fleshy lips, especially those who cannot rely on the strength of their lip muscles, can use this cushion rim mouthpiece to advantage. Produces crisp, easy top tones. 11EW Shallow 15.70mm Extra wide, rather high toward the inner edge. A cushion-rim mouthpiece especially designed for the extreme high register. Because of the extra-shallow cup, the tone is very brilliant, piercing, and cuts well. For players who use heavier than normal pressure in the high register. 11 1/2A Very deep 15.65mm Medium wide, well rounded. Similar to No. 11A, but slightly smaller. Produces a rich, round tone. 11 1/2C Medium 15.65mm Medium wide A brilliant, scintillating tone, very easy response and good, all-around register. 11 3/4C Medium 15.60mm Medium wide, well rounded. Easy playing, with a compact, brilliant tone. Recommended for players with sensitive embouchures and with narrow lips. 11 3/4CW Medium 15.60mm Fairly wide, rather flat, not too sharp. A cushion rim for players with soft, fleshy lips who rely on above average pressure. Responds easily in the high register. 12 Deep 15.20mm Broad, rather flat. This popular model produces a full, mellow tone. A good choice for players of the English or Italian school who are accustomed to small mouthpieces, and players with heavy, weak lips. 12B Medium deep 15.20mm Broad, rather flat. The same rim as No. 12, with a slightly shallower cup to make the tone more lively. High register responds well. 12C Medium 15.20mm Broad, rather flat. Brilliant tone, easy high register for trumpeters who have to play forte in the upper range and for players with heavy, weak lips who have difficulty with the high tones. 12CW Medium 15.20mm Broad, rather flat, high toward the inside. Cup diameter and depth are the same as No. 12C, extra wide cushion rim. 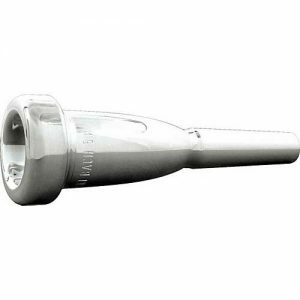 17 Deep 15.10mm Medium wide A small mouthpiece with a solid, compact tone. Players with thin lips find this model highly satisfactory. 17C Medium 15.10mm Medium wide A lively, clear and brilliant tone, for players with thin lips whose embouchure tires easily. 18 Deep 15.10mm Broad, rather flat. Has the same cup as No. 17, but a wider rim. Players of the old Italian or English school having heavy, soft lips and a rather sensitive embouchure choose this model. 18C Medium 15.10mm Broad, rather flat. Same cup design as No. 17C, with a wider and flatter rim to distribute pressure over a larger surface. 20C Medium 15.00mm Medium wide A very small mouthpiece, recommended to players who have extremely weak or delicate lips.